After a record-breaking season in 2016 that saw the Lee's Summit West girls win their third Missouri Track and Field State Championship, six members of coach Jesse Griffin's 2017 squad are in California to kick their season into high gear at the prestigious Arcadia Invitational meet outside of Los Angeles. Last year the Lady Titans went undefeated and scored a state meet record 97 points at last May's state meet in Class 5 to dominate the field and win by 20 points. 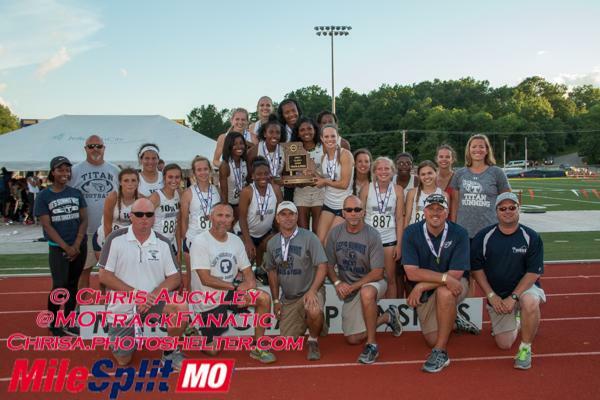 The 2016 Lady Titans were likely the best team in Missouri High School girls track and field history. They didn't just beat the competition, but they had some elite performers that could be counted among Missouri's best-ever and the capable of competing with the country's best. Lee's Summit West claimed an amazing seven event titles at state last year as well as a second and a third-place event finish. This year's team lost just three scorers from last year. Though two of those were very big pieces, including Nicole Kallenberger, the state record holder in the pole vault at 12-10.5 and the 2015 and 2016 class 5 state champion. She's now at the University of Mississippi. Bryce Lang is now at Drake University, and was on all three sprint relays at state, including the 3:52 4x400 state champion squad and the US#49 4x200 team that took second at state in 1:39.82. 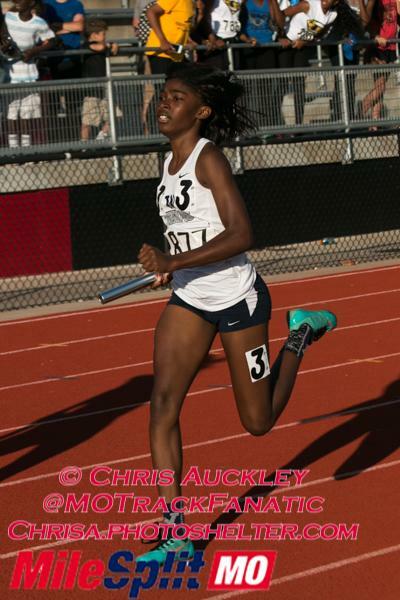 The third scorer not to return was Leah Olawaiye who ran a leg of the third-place 4x100 at state as a senior last year. The six competing Friday and Saturday at Arcadia have a chance to compete with some of the country's best at the 50th edition of the meet in Southern California. The Arcadia meet is the premier regular season high school only meet in the country, attracting some of the country's best talent. It boasts athletes having set 28 national records at the meet, and a total of 179 U.S. Olympians having competed there. The meet is packed full of competition on Friday and Saturday with Invitational, seeded, and open sections of events. The West lady's performances may boost their confidence and the Lady Titans to another state title in seven weeks. Those set to compete include junior Makayla Kelby. After just two seasons, Kelby is already one of the best throwers in Missouri history. 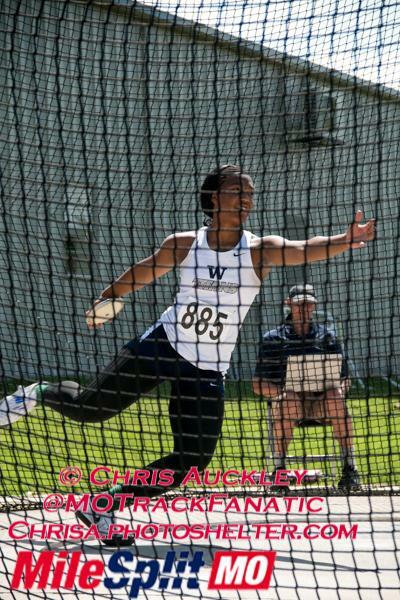 Kelby appears to have the Missouri #2 All-Time mark in the discus with her US#9 163-6 from last year. That puts her about 12-feet behind former Marquette standout and state meet record holder Amarachi Ukabam, who posted a non-state meet mark of about 175'. Kelby's state winning shot put toss of 44-10.75 puts her 13th on the state meet all-time performance list. Sophomore Jessica Haney wasted little time to make an impact during her first year of high school. 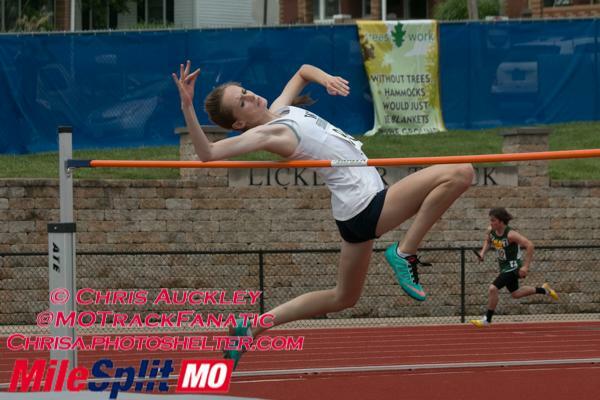 Haney captured the high jump state title by tying her personal record (PR) with a 5-7 clearance in Jefferson City. Haney has added the triple jump to her repertoire this year and so far, has a best of 34-6. Senior Erin Sermons did it all for the Titans last year. Sermons captured the Class 5 state title in the 400-meters. She posted a PR of 55.17 in the prelims. In the 200-meters she placed 5th and has a PR of 24.56. Sermons also ran on the winning 4x400 squad and runner-up 4x200 team. Sermons showed she's got some range last June when she ran a 2:17.22 800-meters. She's headed to New Mexico Junior College next year. The Thunderbirds just captured the women's indoor national title at Pittsburg State University's indoor track facility last month in Kansas. Like Sermons, junior Kyra Atkins captured an individual title for the Titans last year and was an important part of their relays. The sophomore won the 300 hurdles in come from behind fashion down the homestretch to edge out Waynesville's multi-event superstar and now Kansas State freshman Ariel Okorie. 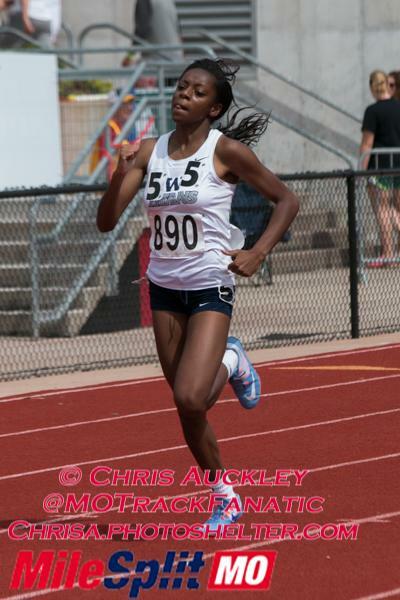 She did so in a nearly 1.5 second PR clocking of 42.79, which puts her 4th on the state meet all-time performance list and was the US#59 mark last year. Atkins also ran on each of the three sprint relays. Sydney Bowers is just the second senior of the six competing at Arcadia. Bowers ran on the third-place 4x100 relay last May and added 9th and 11th place finishes in the 100-meters and 300-meter hurdles. Bowers has a 100-meter PR of 12.48 and a 47.03 best in the hurdles. Last but not least is junior Jana Shawver. As a freshman in 2015, Shawver took second in the 800 at state to Hannah Long. 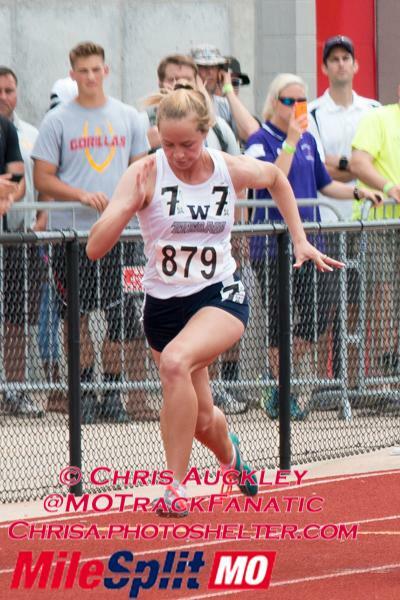 Last year, she finished fourth in the 2-lap event, while also running on the 4x400 and 4x200 relays for All-State honors, as well as a leg of the 15th-place 4x800. 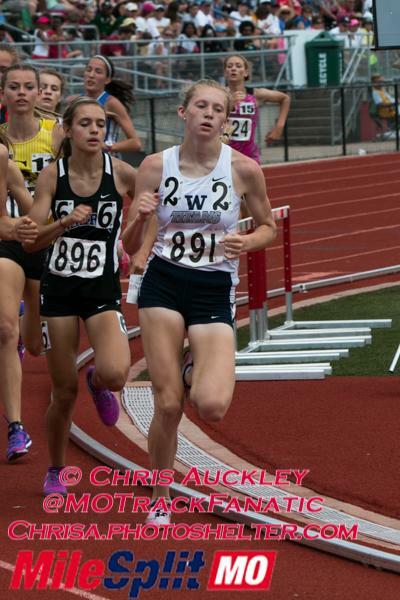 Shawver posted an 800 PR of 2:11.77 at last June's Festival of Miles. She also has a PR of 58.06 for the 400-meters and will run the 1600-meters with emphasis for the first time this year. Some of these athletes made the trip to North Carolina last June to compete in the New Balance National Championship meet, so the big-time atmosphere shouldn't bother most of the group. Two other potential scorers for the West team at State that won't compete at the meet at Alex Marko and Maddie Harris. Marko placed 6th at state in the 3200-meters last May, while Harris took third in the exhibition javelin, which will be a scored event this year. Take into consideration that along with the other young distance runner's for Coach Griffin's team that helped the Lady Titans to runner-up finish in Class 4 at last November's state cross country meet, and don't be surprised if the ladies of West are close to putting up another eye-popping in Jefferson City in seven weeks. So far the season is going well as West has dominated their first two meets, first the Belton Pirate Invitational, winning by 78 points, and then the Blue Valley Northwest Spring Classic by 77 points.